A team of more than 50 students at the University of Maryland's A. James Clark School of Engineering has succeeded in flying their human-powered helicopter, Gamera. 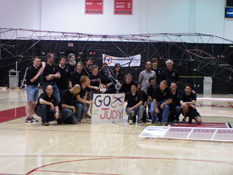 Pilot Judy Wexler, a 24-year-old biology graduate student at UM, pedaled furiously with both her hands and feet, taking the craft several inches into the air for four to six seconds, setting a world record for human-powered helicopter flight with a female pilot. Kris Maynard, the judge from the National Aeronautics Association, announced that the flight looked successful, but that official certification will require viewing of video footage. This will likely occur on the morning of May 13. According to Maynard, no previous human-powered helicopter flight has been certified. If the Gamera flight is certified, the vehicle will be the first in history to do so. "I am incredibly proud of this amazing feat of engineering and physical prowess, and grateful to faculty mentors Drs. Inderjit Chopra, V.T. Nagaraj, and J. Gordon Leishman," said Clark School Dean Darryll Pines. "Today’s flight of Gamera is a fitting symbol of our excellence in rotorcraft research and education, and our first step toward winning the Sikorsky Prize." View hi-res video of the record-setting flight. Visit the Gamera Test Flight web site.